Home security protects what’s nearest and dearest to you and your family when the unexpected happens. From lock repair to access control, Harvey’s Lock & Security can help you sift through home security methods to find one that’s right for you. Do you have home security in place but need maintenance done? With a service fleet, Harvey’s comes to you for your maintenance needs in lock repair, re-keying, hardware installation, and more! Choosing between home security methods can be overwhelming. You know security is important, but how do you know what’s right for you and your home? Begin by considering what assets you need to protect. Do you have heirlooms, documents, or money you need to lock in a safe? How many points of entry does your home have? Do you live in a single-family house or an apartment, condo, or townhome? These factors might guide decision making when it comes to home security. Next consider your preferences. 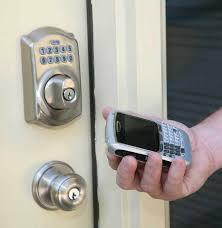 What sort of security do you prefer – traditional lock hardware or electronic security, like electronic access? If you choose mechanical lock hardware, consider what sort of locks you want. If you’re more interested in electronic access, do you prefer wired or wireless security? Let us help you through any questions regarding home needs and personal preferences. Once you’ve assessed your needs – whether you need a traditional lock repair or installation of electronic access, the experts at Harvey’s will help you explore your options when it comes to home security. We’ll answer your questions and assess your unique security needs to ensure your home is fully protected with quality hardware. For more information and assistance in selecting your home security, Contact Harvey’s Lock & Security today!